Dubai, UAE, 3 August, 2015: A leading UAE-based obesity surgeon has successfully completed a first of its kind live bariatric surgery demonstration to peers at Zulekha Hospital Sharjah. Dr Hussam Al Trabulsi, MD, MRCS, FEBS, Specialized in Advanced Laparoscopy and Bariatric (Obesity) Surgery, performed two surgeries – a gastric bypass and a gastric sleeve – in front of more than 100 medical professionals at the end of July. Ahead of the surgeries, Dr Al Trabulsi addressed the audience with an overview of his surgical approach for both patients and offered his guidance and advice in how to avoid complications specific to bariatric surgery. Dr Hussam Al Trabulsi from Zulekha Hospital Sharjah has successfully completed live bariatric surgery demonstrations to an audience of more than 100 medical professionals. “Bariatric surgery has been available at Zulekha Hospital for the past two years and in that time, I have completed 180 successful procedures which have had a lasting impact on the lives of our patients,” said Dr Al Trabulsi. The bariatric team at Zulekha Hospital Sharjah treat cases of moderate to severe obesity four to five times a week. Led by Dr Al Trabulsi, patients are helped to significantly lose weight, reduce cholesterol levels and lower their blood pressure. The option of surgery helps to prevent the development of future conditions such as hypertension, diabetes, arthritis and cardiovascular diseases. Zanubia Shams, CEO of Zulekha Hospital, said, “This is the first time we have provided access to our operating theatres and is a further example of the innovation and creativity that we work hard to achieve among our doctors and within our hospitals. There was an unmistakable atmosphere in the auditorium as the live feed was streamed from the O.R. and we are pleased to have the facilities to host these teaching experiences. 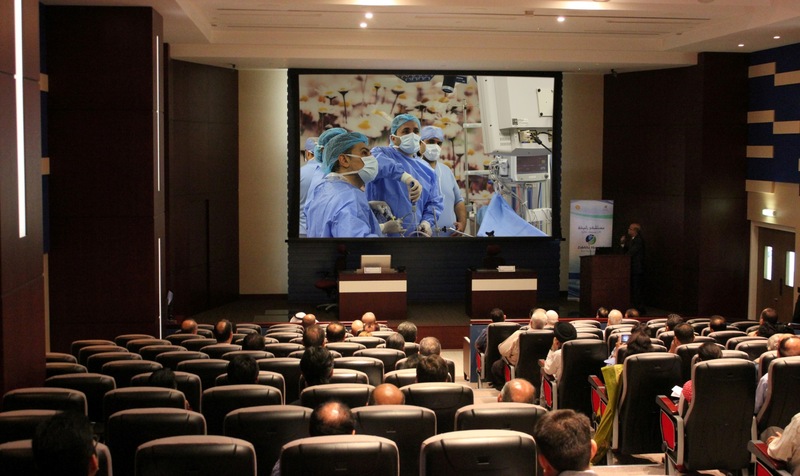 Each doctor who attended the event received two hours of Continued Medical Education (CME) from the Ministry of Health. Zulekha Hospital has a long history as a teaching hospital which dates back to the principles of its founder Dr Zulekha Daud. Last month, Zulekha Hospital Sharjah became the first private hospital in Sharjah and the Northern Emirates to be affiliated with the American Heart Association as an international Life Support Training Centre, offering a range of Cardiopulmonary Resuscitation and Emergency Cardiovascular Care courses to healthcare and non-healthcare professionals. Further live demonstration events, open only to registered medical professionals with pre-registration required, will be planned in the future. For more information, email synapse@zulekhahospitals.com.